Friday will see showers post noon, and may still measure upto 60-80 mms on Friday. Saturday will be seeing heavy rains , again potential for flooding. 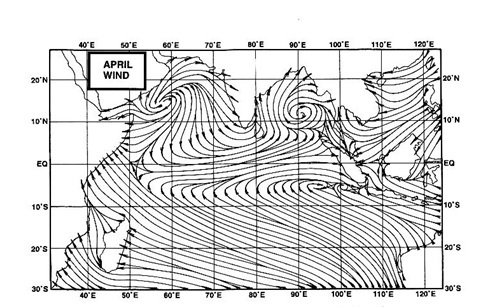 With strong winds, Mumbai may see around 150 - 170 mms on Saturday. Pune, getting fairly frequent showers on Friday (around 35 mms) with the day around 23c. On Saturday, heaviest rains spreading Northwards along coast upto Gujarat coast.Surat may get heavy showers. We had mentioned the formation of an east-West trough thru Mumbai going towards the interior Maharashtra region. 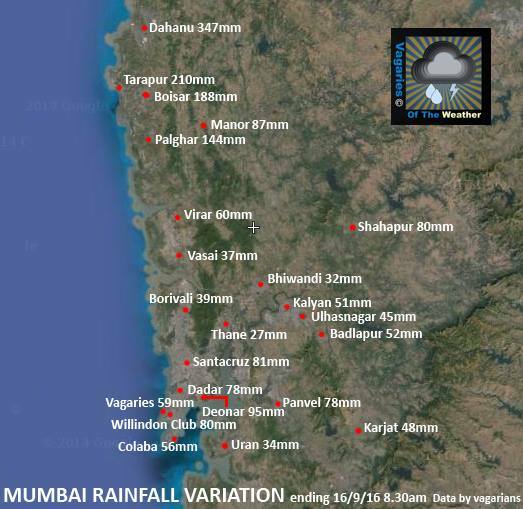 This formed on Thursday, resulting in an initial commencement of rains around Mumbai. Some rainfall amounts from 8.30 am -5.30 pm on Thursday: Mumbai Colaba 20 mms, Vagaries 55 mms and Mumbai Scruz 76 mms. Expect thunder showers on Thursday around Mumbai. Mumbai can get about 40-50 mms on Thursday, increasing substantially on Friday to 140-160 mms. Watch out for flooding. As mentioned, rains will wet Pune next 3 days , with thunder.Around 25 mms on Thursday and 30-40 mms on Friday. Pune must be ready for cool days at 23c. Mumbai Special:Wet and windy Spell ahead ! Starting Thursday 15th September, next 4 days are going to be very wet and windy for Mumbai and all surrounding townships. Thursday 15th will be the commencement of the wet spell, being cloudy with a few showers. Showers start increasing in intensity from early Friday 16th morning, and the day will see heavy rains . Watch out for flooding also. Vagaries would expect between 150-170 mms in 24 hrs (Friday). Fairly frequent showers with thunder. Rains continue into Saturday 17th, with frequent intermittent showers in the day. Again, another 150 mms expected in next 24 hrs.Watch out for flooding. Heavy rains on Sunday 18th, though less then intensity of Friday/Saturday. will add to flooding.Sunday will see let up only after evening. As the reason and cause for this expected heavy rains is an embedded UAC in an East-West Upper Air trough, its outreach may be restricted. Heavy rains will roughly cover the region round 100 kms North and South of Mumbai along the coast, and around 50 kms inland. The ghats between Mumbai and Pune region will also experience heavy rains, along with the stations in Mahableshwar and Koyna regions. May get more than 300 mms. in 2 days. Pune will also witness a wet spell,from Thursday thru Sunday. Thursday will be rainy and wet (40-50 mms), but The peak rainfall (of around 80-100 mms ) will be on Sunday.Cold days ahead the weekend, with the days not exceeding 23c. Great to see more rains being forecasted for Mumbai in this week. Maharashtra (especially the coastal patch) seems to have had a bountiful season this year. Thnx Sir for the detailed forecast. Sir what about the wind speed and will there be thunderstorms or only rains? Rajesh sir ,can you say forecast about my region nagothane,roha,pen. What about Valsad, sir? WillNarrowly miss rain. Hrishikesh: I have mentioned thunder for Friday. Winds will be around 35 kmph on Friday and possible on Saturday. abizer: As your place falls in the range given , it is possible for heavy rains on these days. nilesh: Actually the rain region depends on the actual locational formation of the UAC in the trough. It can always vary North/South by 20-30 kms. GFS expects > 1000 mm for Mumbai! Bangalore very bad September (suppose to be rainiest month - but no rain - Cauvery situation worsens). Thanks for the forecast...but still a question?will it be as windy as compared to mumbai in my region?will it rain with thunder.please tell amount ? Wouldnt surprise me if Mumbai gets 500 mm rains in 3 days. 250mm plus for 24 hours period during friday-saturday. July style rains September. Sharp 9AM HEAVY RAINBIN SANTACRUZ.. Rains have started in mumbai. Come Thursday morning and rains have started western suburbs. Borivali raining heavily since 9 am. rajesh sir what will be the weather for Indore-ujjain division for next couple of days ? its cloudy and very humid here since last 2 days !! Rains have commenced since 2pm in nagothane...moderate in nature. Looks like SWM will continue like June-July over MAHA. Hope Cauvery basin gets good rains in remainder plus in NEM season. Required rains in this area. Also, hope for some good rains in Gujarat overall. Good vagaries has again proved long term forecast may not be valid for changing weather dynamics. Faster system weakens, SWM withdrawl happens better it is water parched south, otherwise we never know all systems over central India may happily spawn another powerful system delaying withdrawl process. No rains as of now here in Mira road. dry krishnaraj sagar reserviour (KRS - over cauvery river) - it is life line for BANG,MYSORE..KAR -- what happens if drought continues??? Apart from this BANG has failed to protect its heritage lakes and trees this is consequence. Doesnt look like post noon rains coming today. It seems heaviest rains will be on Saturday night-sunday-Monday. Could get 400mm rains from tomorrow till tuesday. You agree Rajesh Sir? Rajesh sir,no rain here in nagothane.I and all vagarians should not ask you about long term forecast.As not only you ,but bbc weather too got its forecast wrong about heavy rains on friday.I know there are too many unexpectable changes in the nature...Seeing your forecast I was much delighted but now i am doubtful as i send vagaries link to my neighbours,aquaintances,friends telling that vagaries is the best....Hope that your forecast turns true....though late.what do you think? abizer:Would like to clarify a few points, as you generally go by the international forecast, and tend to not read Vagaries in detail. Vagaries clarifies its changes with proper reasons. The other international forecasts may have gone wrong, with most of them mentioning 100 mms + for Thursday and some were even showing 300 mms for Friday. There was lot of talk and excitement individual forecasts on these forecasts. I have seen posts and amateurs had started warning of a 2005 type deluge in Mumbai with some comments even in Vagaries "stating" 500 mms in 2 days. I kept on with my forecast, with little variations. For Thursday, i said in my initial forecast itself, will be the commencement of the rainy spell. And next day i estimated 40-60 mms. And Mumbai got 55 mms and 81 mms. Friday forecast i modified (on Thursday night) to a delay in rains on Friday.due to reasons also explained, not due to my own will ! Friday , as yet, (typing at 19:55 pm IST) we have received a couple of showers. Models expected 200-300 mms. i thought you might need this explanation to clear your views. svt: Got a few heavy showers here in South Mumbai in the evening (Friday)..lets see at night. Rajesh sir;A question more...when arabian sea moisture laden winds hit konkan causing heavy rains there...but the same rain is called as light and rainshadow in pune.This is termed as orographic.So ,when systems from bay of bengal enter maharashtra throufh pune the same mountains are situated.So in that situation does our konkan become a rainshadow region? Convergence and divergence, in meteorology, the accumulation or drawing apart of air, as well as the rate at which each takes place. The terms are usually used to refer specifically to the horizontal inflow (convergence) or outflow (divergence) of air. The convergence of horizontal winds causes air to rise, whereas the divergence of horizontal winds causes downward motion of the air (subsidence). so "weakening of wind divergence" should be favorable for more rain? People become too impatient if one or two forecasts doesn't materialise. If human can predict nature as God then we are not humans. I guess we need to wait for the forecast period to get over for coming to a conclusion. Dahanu received 350 mms in 24 hours ending today at 8.30 am. Dahanu is also in Konkan. Yes Friday at 9.30 pm it's only couple of heavy showers. Hope Friday night to Sunday forecasts materialises. And I also pray for a good spell at other stations in west and south India. That would really make this monsoon as the best in last few years. sset:- From Jeff Haby's Notes: "Certain regions of jet streaks are more favorable for rising or sinking air. Where convergence occurs in the upper levels, sinking motion results. Where divergence (evacuation of mass) occurs in the upper levels, rising motion result. Convergence and divergence in a jet streak is caused by an imbalance of forces as a parcel accelerates into a jet streak then decelerates out of the jet streak. The depiction below shows the balance and imbalance of forces in a jet streak. Parcel enters region of higher wind speed. This increases the Pressure gradient force at the same time the Coriolis has not been changed much. Wind will tend to flow toward the longest vector, which is the PGF. This causes convergence in the Left Rear Quad (sinking air at letter A) and divergence in the Right Rear Quad (rising air at letter D). The tropopause is just above jet stream level. Convergence at the jet stream level forces air to sink because the highly stable tropopause prevents air from rising." Please note we are talking about Convergance and Divergance at 200 levels...not sea levels. abizer: The lee wards side of the western ghats are at an elevation of around 800-1000 meters. While Konkan is at sea levels. So thus sw winds causing massive lift of moist air on windward side of ghats. Remember, any system coming from Bay also attracts sw winds from arabian sea. Any change of Forecast for Mumbai City next 48 hours? Seems we might miss worst of rains. Mega strormy rains in Dadar-Parel last 1 hour. Rain has finally arrived. UK Met Office just tweeted they expecting 600mm of rains Around Mumbai next 3 days. Tortential rains pouring all night in nagothane.Keep it up.Rajesh sir. Non stop torrential rain entire night with thunders over Mumbai/Navi Mumbai must be around 200mm. Rajesh Sir...eagerly waiting for your follow-up on today's and tomorrow's weather in Mumbai. Sir looks like yesterday most of the rain was just south of Mumbai, but as it moved northwards by night, Mumbai received heavy thunderstorms and today and tomorrow looks the day for heavy-very heavy rainfall in Mumbai. Rain takes a breather here in goregaon at 9 am. Rains have eased considerably here in Mira Road, North Mumbai. Akshay which area do you live in goregaon? Harnai (250mm) yesterday - now it reaches 6000mm since june - excess of 4000mm! guess it has broken all time excess record for any place till now. Colaba joins 2000mm family along with santa cruz. Since onset of monsoon not a single day did kerala receive 3 digit rain (not even 100mm). Earlier govt used to think of linking rivers mainly on east and interior... now time has come to link even west coast! We got rains as told by rajesh sir. Colaba -100 mm and santa cruz - 50.